Home Age Calculator How to How old do you really look? There is a huge difference between how old you are and how old you really look. Some people look younger than their actual age and some people look older than their age. 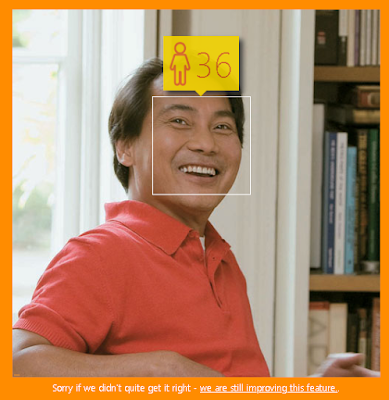 In case you feel you look very young compared to your age and want a computer algorithm to verify it for you then there is a very simple trick. Microsoft has this cool service at http://how-old.net/. All you have to do is upload your very recent picture with your face clearly visible and allow the cloud service to analyze your picture, after few seconds it will tell you how old do you really look. Many times the results are governed by the angle of the face in the picture so try to choose photos with your face looking straight at the camera instead of side angles. You can even search images from internet for fun analysis and try to measure the accuracy of the algorithm, you can simple open the image before analysis and try to judge how old that person looks and then feed that same image to the system. Try to check what is the difference, if the difference is not that huge then the algorithm is doing its job. Microsoft is indirectly trying to promote its Bing Image search feature using this service. If you have a close look closely there is no option of using google as a search engine. Microsoft is also aiming to promote its development service called azure which are used for analysis of the pictorial data to come up with the age. Here is the blog which explains the philosophy behind this whole experiment. Whatever may be the reason the service is very cool and it might actually help you determine if you want to do some changes in the existing lifestyle or continue with whatever you have. We did an experiment on the most powerful man on the planet today Mr. Barack Obama and try to see what the results are which were truly shocking. Step 1: Choose recent picture of Barack Obama. Step 2: Feed the same image to the service. Step 3: check Barack Obama's actual age. Barack Obama look 45 years old where as today his age actually is 53. Do you agree with these results? Well we will let you decide.